HARARE, Zimbabwe (CNN) -- Cash-strapped Zimbabwe revealed plans Saturday to circulate $200 million notes, just days after introducing a $100 million bill, Finance Minister Samuel Mumbengegwi said. 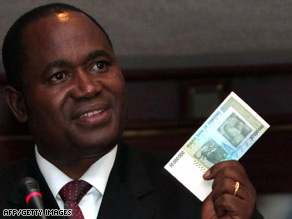 Zimbabwe central bank governor Gideon Gono shows a new $50 million note Thursday. After the $100 million note began circulating on Thursday, the price of a loaf of bread soared from 2 million to 35 million Zimbabwean dollars. Amid allegations of illegal foreign currency trading, the government also fired top executives at four major banks Thursday, according to The Herald, a state-owned newspaper. The Reserve Bank of Zimbabwe had capped maximum daily withdrawals at 500,000 Zimbabwean dollars: about 25 U.S. cents, or about a quarter of Thursday's price of a loaf of bread. Last week, restrictions on cash withdrawals -- due to severe money shortages -- triggered riots. Sixteen soldiers now face possible court-martial due to alleged looting and assaults on civilians and police during the unrest, police spokesman Wayne Bvudzijena told The Herald on Saturday. "We are still investigating the case," he said. "But we expect the soldiers to appear before a court-martial once investigations are completed." After spending several days waiting in bank lines, soldiers rampaged through downtown Harare, destroying shops and attacking riot police sent to disperse the protesters. Cash shortages are not the only crisis plaguing Zimbabwe. Acute shortages of essentials such as fuel, electricity, medicines and food are key indicators of a failed economy, according to economic observers. "The [Reserve Bank of Zimbabwe] is failing to deliver the demands of market, prices are doubling daily, and that demands more cash," Zimbabwean economist John Robertson said. "The huge price increases are resulting from severe shortages of most goods." The once-prosperous African nation is facing its worst economic and humanitarian crisis since attaining independence from Great Britain in 1980. Zimbabwe's official rate of inflation is 231 million percent, the world's highest. Critics of Zimbabwean President Robert Mugabe link hyperinflation to his policies on land distribution and unbudgeted payments to war veterans. Zimbabwe has had no Cabinet since the March presidential election. Its political troubles have aggravated its humanitarian and economic crisis, including a cholera outbreak that has killed close to 600 people since August. A CNN journalist in Harare contributed to this report.